Coshocton is the county seat of Coshocton County in east central Ohio. On July 4, 1776, America formally declared its independence from Britain with the Declaration of Independence. American Indians in the Ohio Country now faced the difficult decision of choosing which side to support. In some cases, tribes fragmented over this dilemma. Such was the case with the Lenape (Delaware). For most of the American Revolution, the Lenape attempted to remain neutral, but they eventually divided into two factions: those who supported the British and those who hoped to remain neutral. Those Lenape who preferred neutrality lived primarily at Coshocton on the Muskingum River. In 1779, Lachlan McIntosh, commander of an American military force, marched to Coshocton and constructed a fort near the Lenape village. McIntosh hoped that this fortification would help sway the neutral Lenape to join the American side. He pledged to the Lenape that the American military would actively assist the American Indians against the British or any other American Indian enemies that the Lenape faced. Fearing that settlers would flood into the Ohio Country if the Americans proved successful in the war with the British, many of these neutral Lenape began leaning towards supporting the British. Among them was Captain Pipe, leader of the Lenape at Coshocton. Fearing that Ohio Country American Indians planned to actively aid the British in their war against the Americans, Andrew Brodhead led a detachment of American soldiers to Coshocton in 1781. He utterly destroyed the village. As a result of Brodhead's campaign, the Lenape fled from eastern Ohio, and Coshocton no longer served as a Lenape town. By 1802, American settlers had begun to build their own community at the site of the former Lenape village. 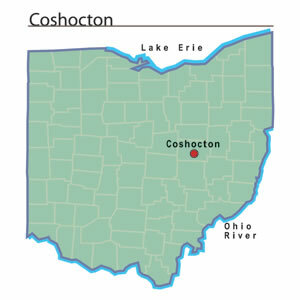 Originally known as Tuscarawa, residents changed the name of the town to Coshocton in 1811. The community grew slowly, even after the Ohio and Erie Canal reached the village. Thanks to the canal, Coshocton became a major commercial center in eastern Ohio during the 1820s and 1830s. Most businesses were affiliated with the canal. Several warehouses existed to ship farmers' crops as well as to receive manufactured goods from the eastern part of the United States. There also were several restaurants and hotels to accommodate travelers on the canal. Although Coshocton had become a bustling economic center, only 625 people resided in the town in 1840. Despite this relatively small population, Coshocton still served as the Coshocton County seat of government beginning in 1810. By 1880, the city's population had grown to just over three thousand people. Most businesses served the surrounding agricultural community. At least two flour mills operated in the city, as well as at least one sawmill. The largest employer in 1880 was Houston & Hay & Sons, manufacturer of axles and springs for especially buggies and wagons. This business employed sixty-five workers in 1887. During the twentieth century, Coshocton remained a relatively small community. In 1995, Coshocton was the only city in Coshocton County. It boasted a population of twelve thousand people, one-third of the county's population. Many residents earned their livings through service occupations, including tourism and government positions, although a number of manufacturing jobs existed, especially in the production of rubber and plastic items. The biggest tourism attraction in Coshocton County is Roscoe Village, a restored canal town from the mid 1800s. Roscoe Village began as a separate community, but during the late 1800s, Coshocton absorbed it. Today, visitors can step back in time and envision what life in mid-nineteenth century Ohio was like. They can even take a ride on a replica of a canal boat. Coshocton County Sesquicentennial, 1811-1961: The Colorful Story of Coshocton County's Past, Present and Future - -in Words and in Picture. Coshocton, OH: Shaw-Barton, 1961. Hershman, Robert R. The Story of Coshocton, Ohio. Coshocton, OH: The Cooperative, 1958. Hunt, William E. Historical Collections of Coshocton County, Ohio: A Complete Panorama of the County, from the Time of the Earliest Known Occupants of the Territory unto the Present Time, 1764-1876. Cincinnati, OH: R. Clarke & Co., 1876.